Toyota Kirloskar Motors have waiting periods for two of their vehicles currently in the Indian market. Needless to say, the first one is the Toyota Etios which is one of the cheapest vehicles by Toyota in India whereas the other one is 4 times costlier than the Etios, the Toyota Fortuner. I am sure that the waiting periods is something which each company would like and dislike at the same. Like, because it means that the company’s model has been accepted by the car buying public and dislike because if the waiting periods are longer, then the car buying people would shift their priorities to other models. Toyota Kirloskar Motors are getting the second aspect covered by launching the Toyota Liva in India, the company’s hatchback take on the Etios, by an expected March 2011. Infact, they are offering customers of the Etios a first serve of the Toyota Liva booking. Now, we at Indiandrives got a privilege of a short test drive of the car that Toyota was offering to journalists prior to its launch in India. Mind you, it was only a 15 mins test drive that we could afford since there was a huge line waiting to test drive the car. So we had to actually send two or three of our office colleagues separately to check out the features which we had missed out on the test drive. A Toyota Liva review would be made available to our readers as soon as the Toyota Liva launch is done in India. The looks of the car are very much from the sedan that it is derived from. However the front looks a bit rounded as compared to the sedan. Also the fog lamps have more of a cheerful design than the sedan. Side skirts anyone? 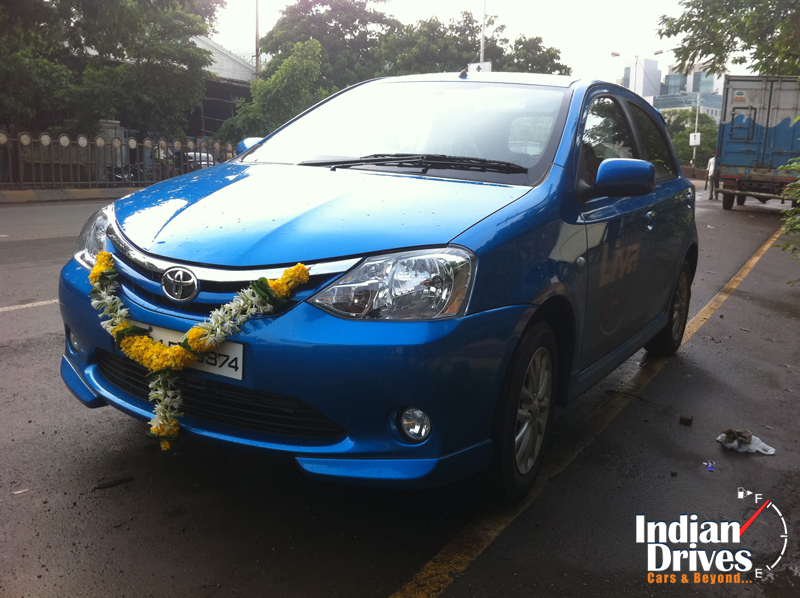 Yes, you get them on the Toyota Liva in India. The side profile of this car looks very much like the Maruti Alto K10. The door handles as well as door mirrors are in body color. The lower variants would have 14 inch wheels whereas the top end version that I or rather we were driving had the 15 inch alloy wheels. If Toyota Kirloskar Motors intend to launch the car with the same alloy wheels scheme, then they have a sure shot winner as far as looks go. The rear isn’t boxy like the Etios and features a more curvaceous design. The tail lamp design is also good with bulges. There is a big chrome bar running across the tail of the hatchback which acts like the boot opener. The tail pipe isn’t visible and is suitably tucked away. The Toyota Liva interior is something which is similar to that of the sedan’s. The layout of the Toyota Liva interiors mirror that of the Etios. The dash is centrally mounted with the speedo, tacho and essential tell tale lights. The front seats are manually adjustable. The steering wheel is also adjustable for rake and reach. The use of materials is evidently un-Toyota like but then they are good for this segment and price point. For a 6 footer, the driver’s seat did take some tinkering around with but then it was far more easy than been in the Beat. The AC did work fine and there were steering controls on the slightly flat steering wheel. Manual adjustment for the ORVMs was also there. Like the sedan, there are many cup holders and cubby holes. Moving onto the rear, it is almost like the sedan except for the fact that the leg space seems a bit tight. The shoulder space also seemed compromised. But then if you can be comfortable in a Swift’s rear seat, then the Toyota Liva interiors would be like a Limo for you. Boot space which was the talking point of the sedan is obviously less in the hatchback. To give you a fair idea, it was around 340 liters. It is just my guess since there wasn’t any data to back it up with. The Toyota Liva specifications were yet to be officially given so equipment levels may go up or down as well. From a short drive, it is almost impossible to think of how a car would behave but then as I mentioned earlier, this article is a combined effort from all those staffers who actually drove this car. The unanimous opinion was that it is almost like the Ford Figo in the ride and handling stakes. Using the same underpinnings as the sedan gives it a good capability to glide over the road imperfections. NVH, even though the motor couldn’t be stretched to its maximum, was of high order and as can be expected from Toyota Kirloskar Motors. By the way, the weight of this hatchback is only 870 kgs. The engine in the Toyota Liva was a 1.2 liter unit, designed to be fuel efficient as well as provide for driving thrills. The cubic capacity has been shortened to 1.2 liters from the 1.5 unit available in the sedan is because of excise norms. I cannot say for sure about the power that it develops and it may be more to what the portals say, 80 Bhp. Since this engine, like the 1.5 liter one also doesn’t feature VVTi technology, it is supposed to be full with friction reducing technologies. The acceleration wouldn’t have you pinned to the seat but then it was almost similar to that. I remember riding a Pulsar 180 earlier on in my riding days and when I shifted from 1st to second gear, I almost rose off the seat due to the sheer acceleration mania that it generated. The Toyota Liva was something similar to it. Due to the low kerb weight, expect 0-100 kmph times under 12 seconds. The gearbox was a 5 speed unit which is the same one in the Etios. The engine felt remarkably smooth to drive. Brake feel was a bit spongy but then I am sure Toyota would kit it with ABS and EBD before the vehicle gets launched. As for the fuel efficiency, it is said to be way better than what we expect from current hatchbacks. I will reserve my comments on the same until we get the Toyota Liva review done. 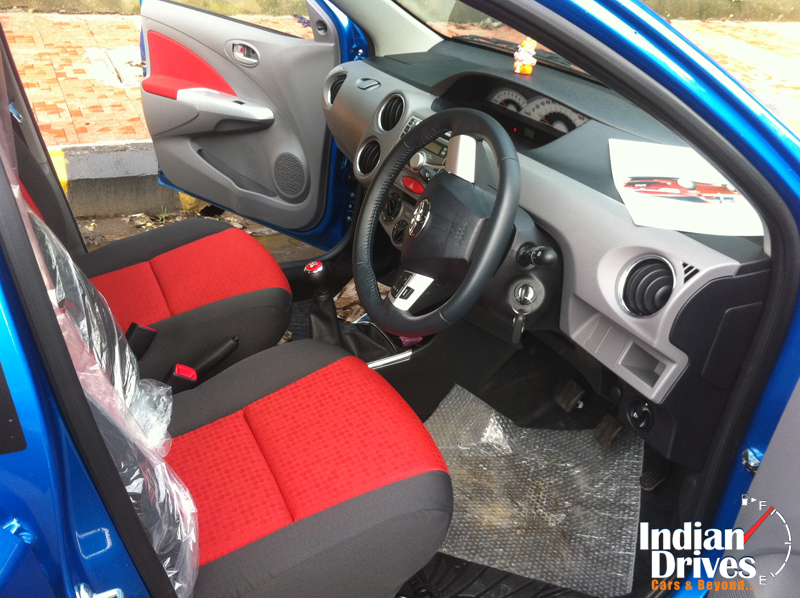 Safety would be handled by 2 air bags, GOA body, collapsible steering column and the 3 point seat belts. As of now, the company would be launching the petrol variant and the Toyota Liva diesel would follow towards the later part of this year. It would most probably the 1.4 liter diesel from under the hood of the Toyota Corolla Altis, albeit in a detuned state. Looking at the pricing strategy by Toyota for the Etios, it is most likely that the Toyota Liva price in India would be atleast Rs 50,000 cheaper than the starting price of the sedan. Need to know the launching date of Liva as I understand that it will not be launched in March as was originally scheduled as per Toyota dealer in Kolkata i.e. TOPSEL TOYOTA.Further,need to know more details of specification and quality of the LIVA.Will it be of high quality as Toyta is famous for!! When will booking of LIVA start and delivery to castomer from the statt of booking. Could you please tell me the mileage and showroom price of Toyora Liva??? Reply soon. could youplease send me livas mileage & price imidt. let me know price of toyora liva and how it sell going on market strting price and model wise price with a c.
Toyota Liva has very appealing look and attractive. We need to know when it will be launched and pricing and fuel efficiency is very catching. Price also matter for small car. Even basic model should have good car sterio, power steering, fog lamps, etc. This will create a huge crowd while purchasing the car. Small cars or hatchbacks playing in India should have a good ground clearance,sharp and bright focussed headlamps and well built shockabsorbers as per the conditions of our roads.Then it comes to the silenser pipe’s placement.It is better not to show this pipe from behind.I think Toyota Liva will match to my expectations. nice look front is seen like big car i think it is definetly beat higher version of small cars kindley send me the prices & fuel consumption details. Please send me details of liva Diesel model with expected date of availability and price of the car & mileage. The Liva is already launched but its diesel form isnt available yet. Liva is a good locking car.But i want to know how looks the interior .Kindly sent the car interior phots and price list. Toyota Diesel Version will be launched on 9th September. Those who are waiting for the Diesel version, this is very good news. The engine will be 1.4 L but the price will be disclosed only on the release date. I think we should get around 21 to 23 Kmpl for long drives. Enjoy guys. Planning to buy the diesel version soon. 1. Top end model of Toyota Liva, is a fine car from almost all aspects. 2. But, some external noise comes inside the cabin. 3. Toyota must improve the overall insulation. of Honda Brio and Maruti Swift. 5. Toyota must increase the number of Dealers, to cover more town. Liva Diesel GD is good option for Swift VDI. I am planning to cancel swift VDi booking(waiting of 7-8months ) and go for Liva GD. after all its toyota diesel Technology. proven in Innova and altis.